It is official! Khloe Kardashian has had enough of Lamar’s lies and has thrown him out of their house together. Despite the constant denial from Kris Jenner of the couple’s problems, thanks to drugs being involved, Khloe had enough of the lies and has shown him who the boss is in the family. The drug use isn’t minor as many might think. 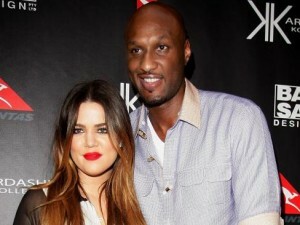 As it turns out, this drug abuse is major and it is quite possible that Lamar and Khloe are over with. For the past 2 years, Lamar has had a problem with drugs, but it got so bad that Lamar and Khloe couldn’t make it work. They tried rehab for him by putting him in San Diego where 24/7 surveillance was put on him so he wouldn’t leave. Because of the constant care, Lamar constantly threatened to leave Khloe. Thanks to the rehab before, Lamar was able to play for the Clippers last season, but afterwards, he went back to the habit. Divorce is not yet in the air, but it is surely going to be discussed in the near future. First off, Khloe thought that Lamar was cheating on her. However, the main reason for the kicking him out was purely on the drug abuse. Khloe still loves Lamar and wants to help him. However, if it is not a two-way street, Lamar isn’t going to get the help that he needs. The family tried to give him an intervention, but he wouldn’t go through with it. It was bad enough that Lamar refused to get help for his drug problem and then he has to go and get himself kicked out too! The entire incident happened on Wednesday, but the final reason came out recently since the media kept bringing it up and Kris Jenner finally caved in to the issues that were surrounding the couple. It is another thing that is going to bring down the relationship. Also in recent news regarding the Kardashians was that of Kim and Kanye having marriage problems. However, this could be a mix of the baby and Kanye’s need for attention. Either way, fans of the family and friends are proud of Khloe for dealing with the solution. Hopefully Lamar will have some time to think of what he has done and will come to grips with his problems. The NBA star is no stranger to dealing with his daemons and this is something that can be dealt with only when he comes to the reality that it needs to be dealt with.